Skillful MSG file examining solution. Perform depth analysis on MSG Files. Save and Convert MSG file into readable format. Ability to analyze emails along attachments of MSG files. Support multiple email client while analyzing the MSG files. 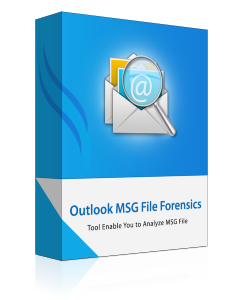 To analyze MSG file, user needs to make a use of MSG file forensics tools that helps in previewing any number of Outlook emails along with attachments. Further investigator gets detailed information of every MSG file email such as sent data, subject, & size in KB. While performing email investigation for MSG file, our tool facilitates to auto locate folders which contain MSG file emails. Once the software is launched it starts scanning and then provide the preview of MSG files. The MSG file forensics tool provides investigator the option of different kind of search as per their requirements, they can apply search within the MSG file. Here user can simply put any specific keyword or phrase to filter out emails. Meanwhile, user can add different search criteria to get better filtered result. For proper MSG File forensics, the tool enables you to manage the order of the list according to its attributes. Here the user are free to re-arrange & view the Outlook MSG files on the basis of of their multiple properties such as subject, sent date, to, from, etc. DEMO version allows you to scan, add and preview the evidence available within Outlook MSG files. If you want use advance search, go for PRO version. Upgrade to MSG File Forensic Pro for Advance Search. How can I Save and Convert bundle of MSG file? By the use of Pro version users are enabled to save as well as covert the MSG file into a more readable format. Is there is any limitation to the file size which I can examine using this tool? The software does not specify any such limitation, here users are free to examine the bundle of the MSG file according to their requirements. "Being a forensic investigator I want to examine my MSG files as they are corrupted due to some technical issue in my local machine. I just browsed & selected the MSG file to examine all within a nanosecond. This software works great and I am just amazed by its working." "The finest thing about the software was that, there is no need to install Outlook before analyzing MSG files Meanwhile the tool already has a provision to open any size of of data without any obstacle. It is simple and powerful."